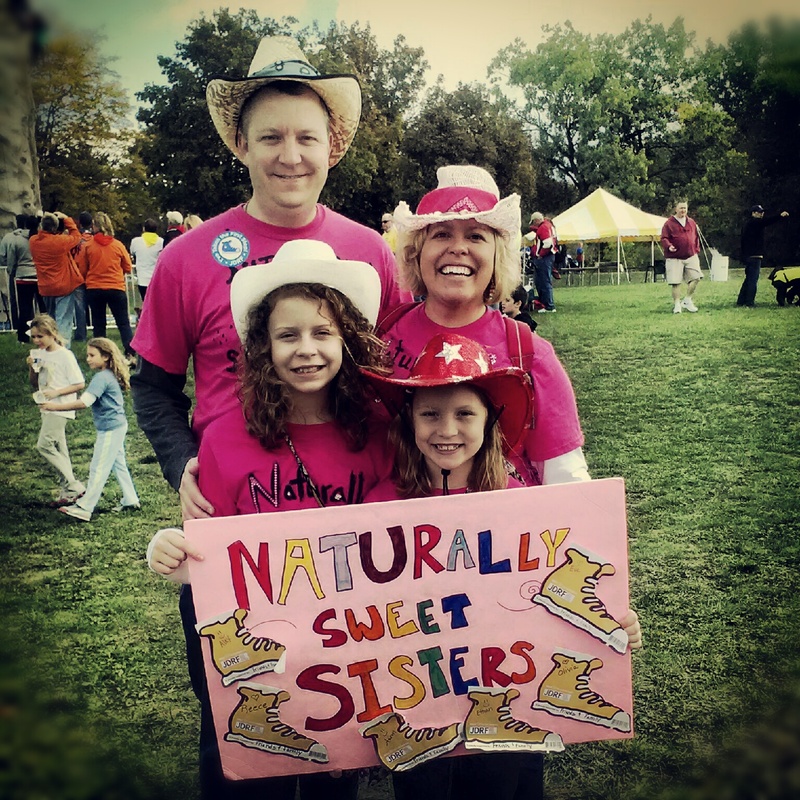 Naturally Sweet Sisters: Awards or Rewards? We NEED A CURE. 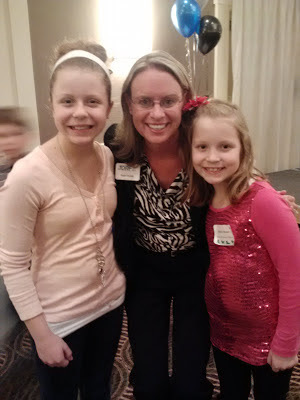 Tuesday night was our local JDRF Chapter 2012 Walk to Cure Diabetes awards banquet. My inclination is quite often to shy away from the spotlight for receiving any recognition which quite honestly, is for something that I feel we NEED to be doing. None of us NEED a trophy or a nice dinner or our team names printed on a piece of paper or a banner. But we do NEED a cure. 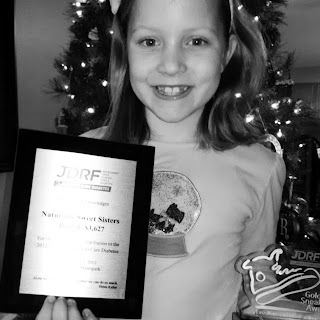 Along side of my thoughts and always the observer, I immediately noticed that upon receiving the invitation to the JDRF awards banquet, how excited my two daughters became. Really, really excited. I mean, the big guy in red has nothing on a JDRF awards banquet! That's how excited the Naturally Sweet Sisters were! My oldest instantly asked who would be there. Her old friends from camp? Her new friends from the WDIV segment or the Promise Ball video? Our favorite doctors? "I can't wait to see everyone. The awards night is so much fun! Who are we going to sit with? Call so and so's mom and tell them to save us a spot!" And I realized that for her, this was about connecting... and remembering the connection that I feel from seeing 'my diabetes peeps', well the awards banquet is that same moment of connection for her. A moment to be surrounded by people that are actively cheerleading her on to manage her type 1 diabetes, advocate for better care and to grow up into the most amazing adult that she can strive to be! It is a powerful feeling to feel that kind of comfort. My youngest daughter zeroed right in on the trophies. She wondered out loud, "What am I going to win? What will the trophy look like? Can I take it to school and show my friends? How BIG will it be?" She grinned in anticipation and danced around the room like a Miss American pageant contestant, waving to her beloved 'peeps'! Because for her, the honor is much more than how many dollars we raised. It is about the fact that she has been living with type 1 diabetes for almost her entire life; six out her nine years. This is an award for her perseverance and courage despite the ups and downs that type 1 diabetes can (and often does) bring. In thinking about my daughters' feelings, I changed MY thinking. There is a NEED for an awards banquet. A need to connect and to reflect on the amazing strength of these two girls. To think about their desire to make a change in the world and to leave an impact on type 1 diabetes that just may result in completely ending diabetes all together. Like our favorite JDRF Executive Director, Kate Durak said in her speech, "Our hope is that we will all be out of a job next year, but just in case that doesn't happen, we will plan on meeting back and continuing our work towards getting a cure." JDRF is not giving up. And neither will the Naturally Sweet Sisters. 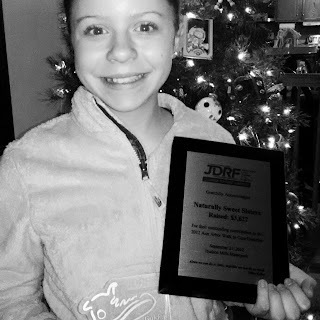 Because we NEED that ultimate award: A CURE FOR TYPE 1 DIABETES. Please consider joining us. Donations can already be made for 2013. And thank you to everyone who donated to the 2012 Walk to Cure Diabetes Naturally Sweet Sisters team. Our grand total was $3,627.00. Our daughters each received a golden sneaker award and our team received a plaque for Bronze Level Achievement. I also received two beautiful silver JDRF sneaker pens for volunteering throughout the year as a Family Team Coach. Special recognition to all of the families that dedicated their summer to fundraising. Thank you for continuing until a cure has been found.